Never mind the bio, let’s talk about the process. I started burning with an old school wood burner, the kind we got in kits when I was a little girl. My husband decided I needed something better, so he ordered me a Razortip wood burner. I started out using fungus or better-known artist conks, my first good design (in my mind) was an owl. I still burn on fungus but also use an array of salvaged wood, from cedar burls to alder, huckleberry and bamboo, although the bamboo does not hold the burn as well. Animals and nature are what drives my creativity, but I have been known to burn a bike, a Harley and a truck with great success. Once the wood or fungus is salvaged it needs to come in and dry. Sometimes, weeks, sometimes months or years. The drying pieces gather around my studio, so I can see them. Eventually a piece jumps out at me or speaks to me. I then study the piece on its own sometimes for months. I never sketch out my idea it develops in my head and on the untouched canvas. Although you can be sure to find little corners and tidbits of paper with a paw or an outline or an eye or a tiny thought somewhere around my studio. As the idea develops, I pull the piece out beside my burner and begin to burn. It is not a fast process, I must think out each idea step by step as I burn as there is no erasing or wiping off the paint. Either the design becomes what I envisioned, or it must be altered due to an error or it gets discarded. Discarding a piece is not much of an option because each canvas I use is so unique, however, there are a few that didn’t make it to the finish line. Because of the unique canvas’s I use and the fact that I do not sketch out the design prior to working all the pieces I create are one of a kind, no duplicates. 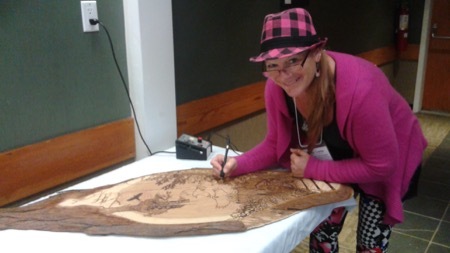 I am a member of the Pacific Rim Arts Society, The Community Arts Council of the Alberni Valley, Alberni Art Rave and the Federation of Canadian Artists. I participate yearly in the Island Arts Magazine Calendar, as many juried art shows as time allows, Art Splash an Annual Art Show during Pacific Rim Whales Festival & Alberni Art Rave. In 2016 I travelled to London England to participate in the Parallax Art Fair which lead me to be invited to be an exhibitor at Gabriel Fine Arts for one year — gabrielfineart.co.uk. I have a solo Exhibition coming up in Manhattan NY July 10 - 28, 2019, details to be announced.